Every year, thousands of high school students head to the track, pool, or stadium dreaming of greatness. Hundreds make it to college-level competition. A handful become pros. But when all’s said and done, just one athlete takes the gold. Likewise, content marketing has become a highly competitive landscape. Thousands of writers, brands, marketers and entrepreneurs compete day in and day out for attention on the web. But did you know that a single consumer is exposed to thousands of marketing messages every single day? And that 50% of content marketers don’t know what success looks like? To have a shot at connecting with your audience, you must become a champion content marketer. But what does that look mean? In our latest eBook, The 2016 Content Marketing Summer Games, we uncover the 7 traits of champion content marketers, and tapped into medal winning advice from 7 content marketing athletes to help you train for content marketing greatness. What Makes a Champion Content Marketer? We all have the opportunity to do something great, but it’s the dedication to training and pushing yourself to be better that makes true champions. This eBook will identifies and provides guidance on traits of champion content marketers including: how to create a winning experience, ways to push content potential, how to confront your fears, and more! The tips, tactics and insights in this new eBook are all focused on one thing; helping you become a content marketing champion. Now’s the time to dust off your keyboard and start stretching your content marketing muscles to prepare for the race of your life! 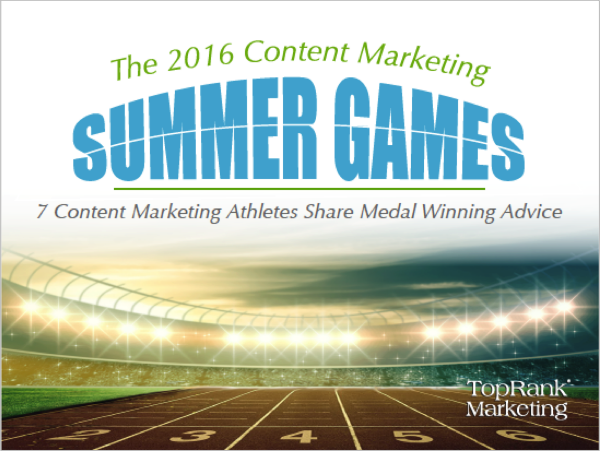 Take the first step by downloading The 2016 Content Marketing Summer Games.